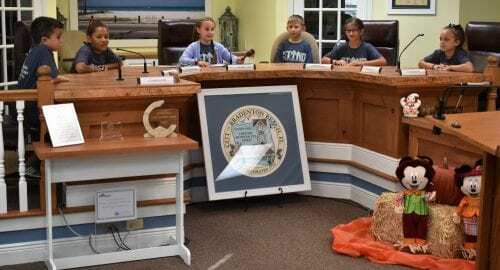 A few weeks ago, we had the pleasure of hosting a class of third graders from Bradenton Christian School who were visiting Bradenton Beach to learn first-hand how local government works. We were thrilled to provide lunch for these adorable future leaders of Manatee County after their exciting day visiting City Hall. 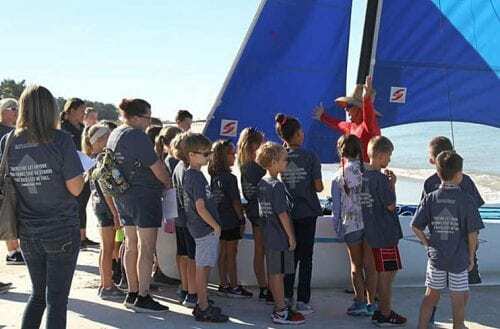 They also had some other unique Bradenton Beach experiences like putt-putt at the Fish Hole, sailing on the beach with Commissioner Ralph Cole, a tour of the bakery at our friends the Beach House, and more! So many people came together to create this wonderful day for these kids… pretty awesome. Our friend Ricinda Perry’s daughter Victoria was in the class, and was elected Mayor for a Day and also appointed Class Reporter – busy girl! Victoria shared the following article with the AMI Sun about her experience learning the value of a happy & healthy local government. BRADENTON BEACH – Today I learned how the city government works and all about the community of Bradenton Beach. The day was full of activities my 75 classmates and I got to experience. We got to meet Mayor John Chappie, who brought in his dog, Coleman. He made all of us feel welcome and his staff was so nice. I was in the first rotation of students that held a City Commission meeting about a barking dog (Coleman). It was the mayor with five commissioners. Our commission voted to fine Coleman’s owner $500 and let Coleman’s owner build a doghouse. The teachers told me later that only one of the three classes forgave Coleman’s fines. My classmates loved this experience and I loved being mayor. It’s so cool to see how our government works and City Clerk Terri Sanclemente had special certificates for us. My classmate Teddy said he wants to be a mayor when he grows up. “I loved being a commissioner,” said Kierra Mays. Next, we went to the beach and Commissioner Ralph Cole taught us about having fun sailing while still being safe. “All kids should have a chance to learn about sailing. It teaches them so much,” he said. Afterwards, we walked down the beach to Turtle Watch Director Suzi Fox. Suzi and her 117 volunteers protected 30,000 baby sea turtles this year! After that, we went to the Beach House and Will, Dave and Teddy showed us around the kitchen and bakery. We left with homemade cookies. Next, we went to Tingley Memorial Library and Mrs. Clarke and Ms. Bell read to us. I didn’t know the city had its own library and I love to read. 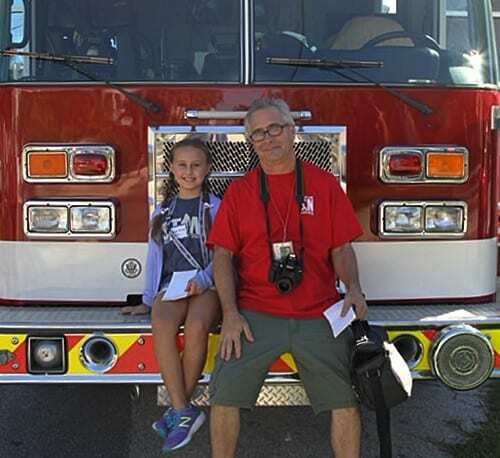 Following story time, we went to the fire hall and met West Manatee Fire Rescue Inspector Rodney Kwiatkowski. He talked about fire safety. Firemen are required to get their suits on quickly and Firefighter Derek got in his suit in 14 seconds (with a little help from another fireman). The most exciting part was when we got to go in the fire truck! Then we went to Lou Barolo Park and played ‘Mayor says’ with Vice Mayor Marilyn Maro. She was very nice. “Today is a good day. I think everybody is learning how the city runs and what everybody does,” she said. A very exciting part of our day was when we went to the Police Department. Chief Speciale was at the door to greet us. He has a lot of trophies and cool toys in his office. Sgt. Diaz took us through the building. Everyone wanted to be ‘booked’ in the intake area, but he said we were good kids. They took us out to the police vehicles and that was so fun. We made as much noise as we wanted and there were all these honks, sirens and beeps. “This is the coolest ever,” Kenny Hamilton said. We also got a peek at Public Works, where Tom Woodard works. He brought us popsicles and we saw Kitty Dog, their adopted stray cat. We ate a delicious cookout lunch at the Anna Maria Oyster Bar, provided by John Horne and his workers. It was very pretty sitting on the pier eating and watching the boats. After we ate, we went on a boat ride with Sherman Baldwin’s Paradise Boat Tours and saw lots of dolphins. The captain, David Merullo, is a commercial fisherman too. We learned Bradenton Beach has 165-175 Atlantic dolphins that live between 35-45 years old and the oldest dolphin that they know is 70 years old. Her name is Nicklow. “This was a great event. We really enjoyed it. City staff had a great time hosting the Bradenton Christian third-graders. I think the program worked really nice and I hope we can do this next year,” Chappie said. “The day went awesome. We had the best time with all the kids. They all did a great job. We can’t wait to do it again next year,” Sanclemente said. “I think it was a great opportunity for our students to see what’s going on in our government. I appreciate the city of Bradenton Beach opening their doors to our school,” Principal Jeff Myers said. My teachers want to come back with next year’s third-grade class. I learned so many things and was surprised by how much everyone works together and how nice everyone was. I love Bradenton Beach. – Sun reporter Joe Hendricks served as Victoria’s mentor and editor for this story.